That comment, as well as many other similar sentiments, were made following the extremely successful Christmas concert. Yet again, the concert was a sellout and the evening was well received by everyone. The Saxy Maids, CSC’s talented guests for the evening, performed a selection of wonderful seasonal tunes and our compete, Bruce Taylor, entertained us with his unique and witty comments. A retiring collection was taken for Merlin MS and in excess of £600 was donated by a very generous audience. CSC’s Christmas concert is always successful but this one seemed to really touch everyone. It was, perhaps, the programme, but we like to think it was probably due to the commitment, hard work and talent plus the guiding hand of our Musical Director; Alastair Taylor. Whatever the reason, 2019 promises to be an exciting year for Cornwall Symphony Chorus with more of the same. The long awaited 2018 Christmas concert will soon be upon us and the Chorus are busy in rehearsals to present another fantastic evening. Held again at Truro Methodist Church, the Concert will be on Saturday 1st December at 7.30pm. Tickets can be purchased through Truro Tourist Information Centre (01872 274555), via Chorus members or on 01209 842977 or online at crbo.co.uk/cornwallsymphonychorus (01726 879500). All details are provided on the poster. This entry was posted in Events, Other. What an amazingly wonderful event! The long awaited celebratory Concert with our two Vice Presidents; Alan Opie and John Treleaven was an unprecedented success with everyone; Chorus, Soloists, Accompanists and audience greatly enjoying the evening. Held in such superb surroundings, the sound of the Chorus was amazing, reaching right to the back of the Cathedral for all to appreciate. As expected, our soloists delighted us with their individual performances but stepped it up to the next level with their duets, especially the well-known “Pearl Fishers Duet” which produced a tear or two from some audience members. Well done to everyone involved – all the hard work paid off. If you were unable to join us for this Concert, don’t worry. We are now in rehearsals for our renowned Christmas Concert which will be held on December 1st at Truro Methodist Church. Continue watching this space for details regarding ticket sales! Cornwall Symphony Chorus is pleased to announce it is supporting the Tregothnan Estate in their Open Garden weekend on the 21st and 22nd April where they hope to break last year’s £50k charity fundraising collection. Our members will be singing on Saturday 21st, all to help raise funds for the Merlin MS Centre near St Austell. We hope you will come to support this worthy event and we look forward to seeing you there. The most important Concert of 2018 is our long awaited event at Truro Cathedral; ‘Voices in Harmony – A Musical Celebration’. As the title suggests, this Concert is a celebration of Cornwall Symphony Chorus’ 10 years of singing and performing together. It has also been made extra special by our two Vice Presidents, John Treleaven and Alan Opie, who have enthusiastically agreed to join us for this commemorative occasion. They last sung together 35 years ago and, as Cornish lads, they are just as excited about performing together again, as we are to have them both joining us here in Cornwall for this significant event. Do not miss this unique opportunity as this truly promises to be a musical celebration of ‘Voices in Harmony’. Tickets can be purchased at The Hall for Cornwall – go to www.hallforcornwall.co.uk for further details. This entry was posted in Events, News, Other. Yet again, the Cornwall Symphony Chorus Christmas Concert was a sell-out success.Tickets for our Christmas get-together are always in demand and this last Concert was no different. 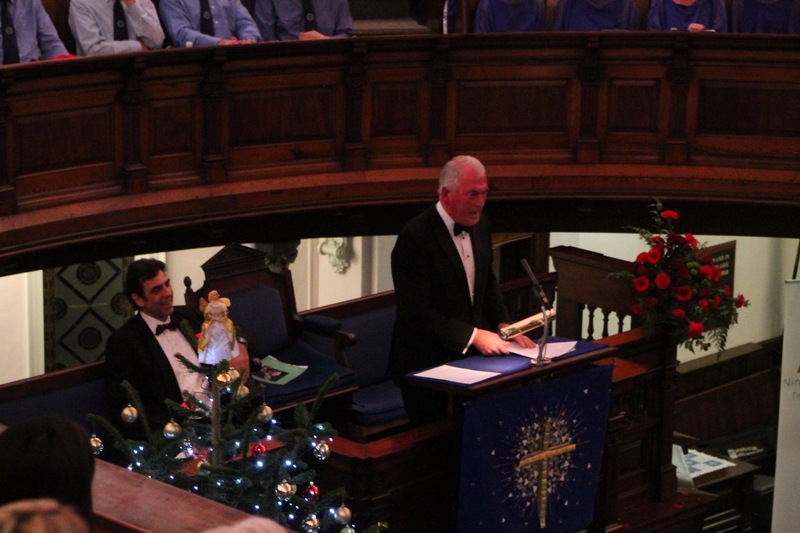 We had two old friends with us; Bruce Taylor as our Compere and Ben Hoadley as our guest soloist – both of whom are always well received by both audience and Chorus alike. This Concert was also an opportunity for the ladies of the Chorus to reveal their fabulous new tops and there were numerous complimentary comments about how stunning they looked!